IV Starts -- Improving your odds! 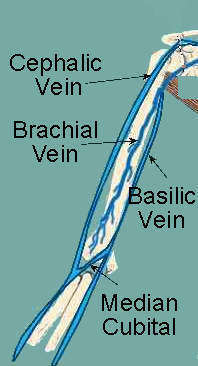 Start at the hand and work up - preserve as much of the vein as possible for future use by starting as low as possible. 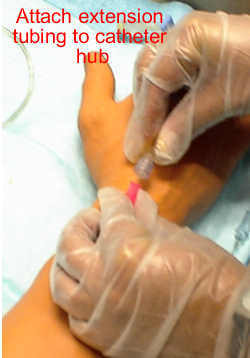 Apply tourniquet 3-5 inches above the potential venipuncture site. 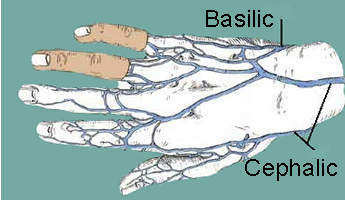 You should be able to palpate a pulse distal to the tourniquet. 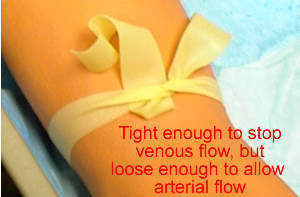 Select a vein that rebounds (soft, bouncy feeling) when pushed. 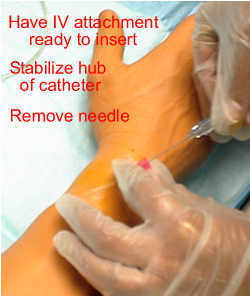 When possible, select a vein on the nondominant arm that will not interfere with the patient's activities. Release the tourniquet, gather and prepare equipment. 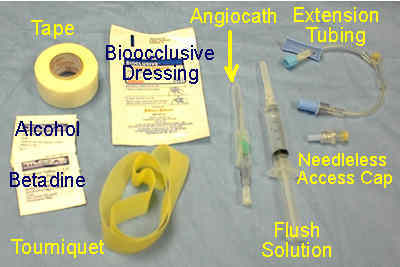 Prepare equipment, including IV bag, tubing, and pump as needed. 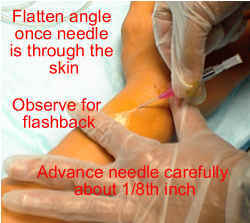 Check agency policy for use of a topical anesthetic for cannula insertion. 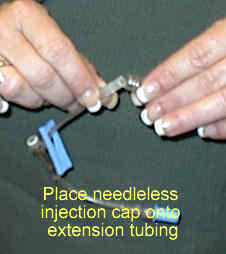 Select insertion device depending on the patient situation. Over-the-needle cannulas (Angiocaths is one brand) are flexible plastic cannulas with a metal stylet for insertion. 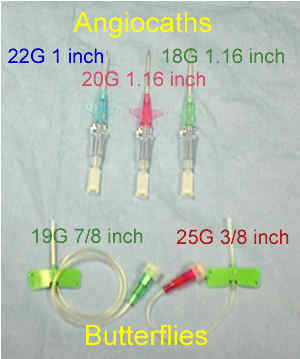 An 18-19 gauge is recommended for infusing blood in adults. Cleanse according to agency policy (often povidone iodine and/or 70% alcohol) - use a circular motion from the site outward. 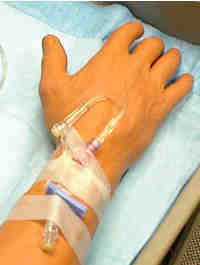 Anchor the vein, being careful not to touch the cleansed insertion site. 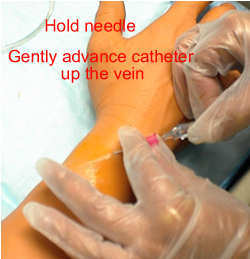 When using an over-the-needle catheter, insert with bevel up at a 450 angle until through the skin, then immediately lower the angle to 20-300 (You may use a 20-300 insertion angle throughout). 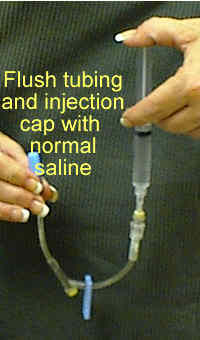 Flush site with normal saline.